Ancient skin care treasures from around the world have been packed into one little balm. The decedent skin care experience that Lina Hanson has created makes me look forward to using her products every day. This balm helps minimize eye area issues such as puffiness, lines and dark circles. It nourishes the skin with moisturizing fatty acids and damage-reducing antioxidants. ​*Disclosure: ​I ​received this product for free. I only publish reviews of products that I love. The opinions in the post are completely my own. There may be affiliate links below. Click here for more details. 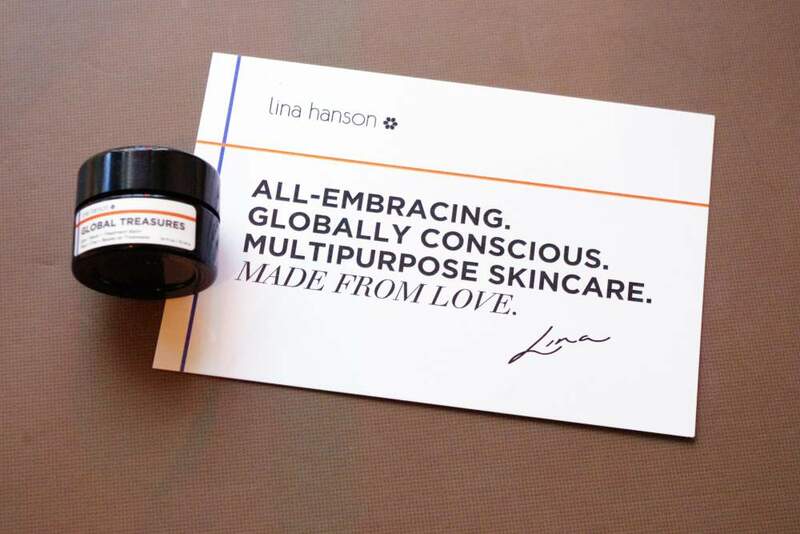 Lina Hanson has created a line of skin care products that bring together the best ingredients the world has to offer and formulates them to be excellent for all skin types, ages and ethnicity. Every ingredient is sourced from local farmers, supporting the livelihoods of people around the world. I believe in easy to use, high-quality skincare. By drawing on beauty traditions from around the world, using only the purest ingredients, I create luxury skincare for the globally conscious. Every time you use my products, I want you to feel that no matter your age, ethnicity, color, or shape… you are beautiful. Lina Hanson is such a sweet woman with a strong and noble mission. 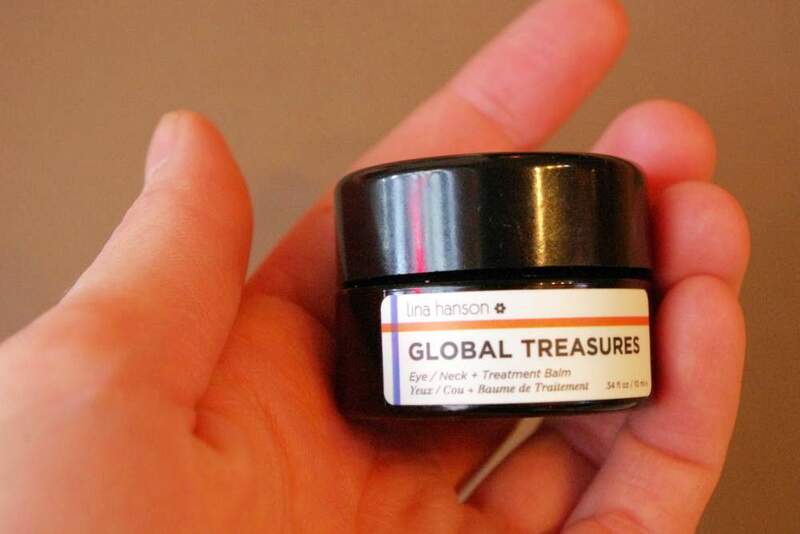 She sent me the Global Treasures along with the Global Face Trio to try out. 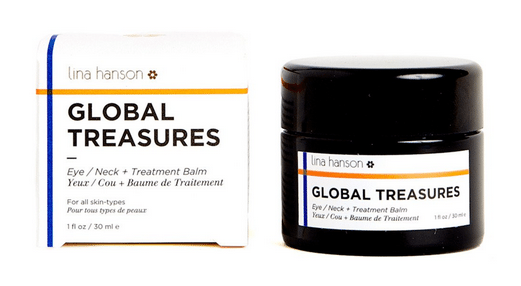 I love all of the Lina Hanson products I have tried. Her Global Body oil is to die for and her Global Face Serum is what I reach for when my face is feeling extra dry. The first thing I noticed about the product was the color. I love all these colorful balms being created in the green beauty world (such as May Lindstrom’s Blue Cocoon and Mahalo’s Rare Indigo Beauty Balm). I also noticed the little gold flecks. What a luxurious addition! The scent is light and sweet. Slightly citrusy with a hint of vanilla. The texture is smooth and creamy. Like any balm, this product is slightly hard in the container, but melts on contact with the skin. It is effortless to apply, just a light swipe over the eye or neck area and it is done. It sinks into the skin and doesn’t leave a shine. 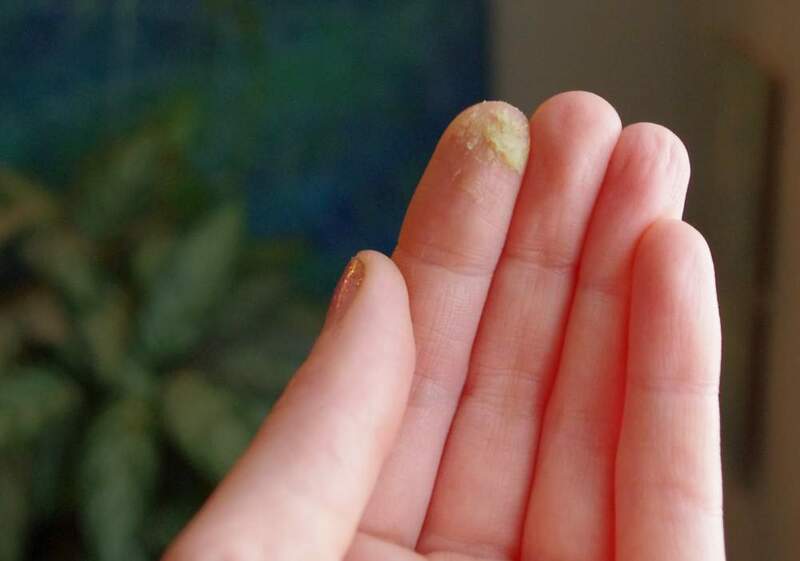 Oil from the green tea plant. A brilliant moisturizer with anti-aging benefits due to its high antioxidant content. Ancient Chinese beauty secret known to regenerate collagen, accelerating new skin growth, increasing elasticity and repairing scars and sun-damaged skin. ​Gold reduces the appearance of fine lines, improving blood circulation, brighten the skin and is a powerful natural antioxidant and rejuvenator. Packed with antioxidants, de-puffs tired eyes and diminished dark circles, while improving circulation and plumping the skin. Dark violet glass jar with a plastic lid. Ideal for all skin types, especially mature skin in need of nutrients. This balm works at reducing my puffy under eye circles and it feels great on my skin. It nourishes with fatty acids and rejuvenates with potent antioxidants. You only need a tiny bit of this balm to nourish the eye area. If you were to apply it to your neck, you would need a bit more. I think that this jar, though small, would last at least a few months. The shelf life is most likely 1 year. I love using this as an eye balm. I apply it in the mornings to combat under eye circles and to prevent wrinkles. I haven’t used it on my neck because I want it to last me a long time and I feel like my eye area needs more of the special attention this balm gives. 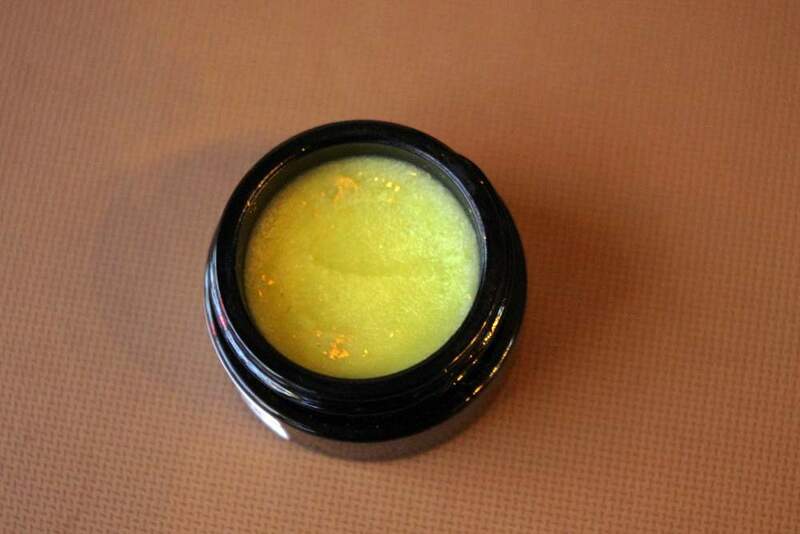 The addition of pearl powder and gold flecks takes this balm to a level of luxury that you can’t get just anywhere. 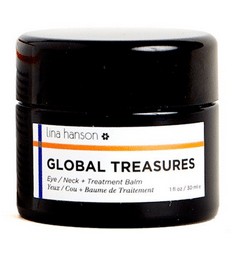 ​Lina has truly sourced global treasures and packed them into one little balm. I want to use it on my whole face! Lina has poured her love and soul into her brand of skin care products and I can feel that love radiating from the products. So much care has gone into them, from the packaging to the colors, scents and ingredients. Lina has created a luxurious and indulgent experience that I look forward to every day. I give this treatment balm a 5/5 rating. I can’t find a single thing I don’t like about this product. It offers ingredients for minimizing eye puffiness, such as coffee and green tea, and it will help reduce wrinkle formation. This balm is a pleasure to use. The addition of luxurious ingredients makes this balm pricey. Please leave any questions you may have in the comments below  And Share this article with someone who could benefit from Global Treasures!